Indulge your passion for fashion with this 18" Honora precious metal and pearl necklace from the Aurora collection. 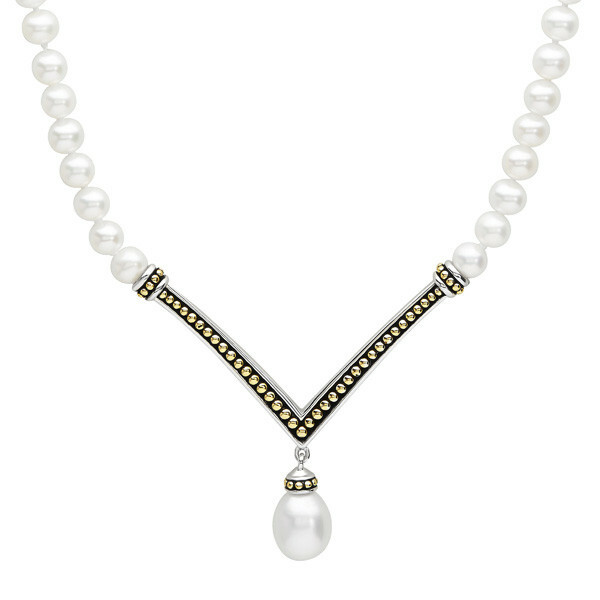 Crafted in sterling silver, two-tone rondelles, with polished 14K yellow gold plating popping against a blackened background and polished silver edges, separate the piece's pearl strand and chevron-shaped element that dangles a 6-7mm oval white freshwater cultured pearl drop with a dot-detailed cap. This Honora necklace is elegant and sophisticated.